Johnson and Johnson De Puy ASR Hip Implants is prone to early failure. All components of the DePuy ASR XL Acetabular Hip System are part of the DePuy ASR hip recall 2010. When would the surgery have occurred? Will I need another surgery? One of the ways to determine if you have one of the recalled device is through your medical device ID card. Many of these cards list the specific make and model of the hip implant. 1. 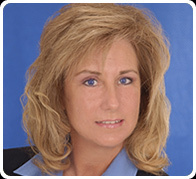 Schedule an appointment with your medical doctor. Your doctor will evaluate how your hip is functioning. Signs and Symptoms of Hip Implant Failure. 2. If you are experiencing hip pain or difficulty walking, contact your medical doctor. 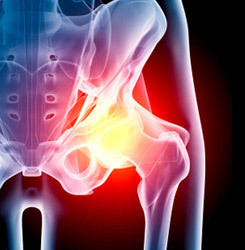 You medical doctor will perform tests to determine if your artificial hip should be replaced. Based on that evaluation, your surgeon will discuss next steps with you. 3. Some of the diagnostic tests your medical doctor performs may include a blood test that measures the level of microscopic metal particles that are circulating in your blood stream. If the blood test indicates a high level of these particles, your medical doctor will likely perform a second blood test three months later. Even if you are a symptomatic, you may still have high levels of the microscopic particles circulating in your blood stream, so this blood testing is extremely important. 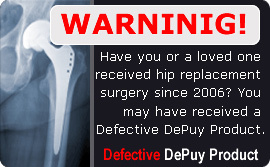 The defective DePuy hip implant is generating the microscopic metal debris that is circulating in your blood stream that is being deposited in your tissues and bones. Research shows this metal debris could be carcinogenic. If you or a loved one has suffered complications from a defective hip replacement device, remember you have valuable legal rights. You may be entitled to compensation. Copyright © HipReplacements 2010. All Rights Reserved.